2. Shapes (Word, Excel, PowerPoint). Microsoft Office contains geometric shapes, both two and three-dimensional. Microsoft Powerpoint contains the most complete two dimensional shapes: triangles, quadrilateral, pentagon, hexagon, heptagon, octagon, decagon and undedecagon. If you want to create a regular polygon by pressing the SHIFT key on your keyboard while drawing the polygon. 3. Transformation (Word, Excel, PowerPoint). Rotate and flip are types of geometric transformations. 4. Congruence (Word, PowerPoint, Excel). Any shape copied and pasted are congruent objects. Teachers can probably explore this feature together with the transformation feature to explain congruence. 5. Similarity (Word, Excel, PowerPoint). The zoom feature in MS Office can be used to enhance the understanding of students about similarity. For instance, they know that similar objects are just zoomed in our out. They change their size but do not change their shape. Similarity can also be shown when resizing. 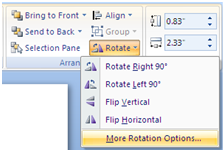 When resizing an object, you can right click it, click Format Shape and select the Size tab. To resize, you should Lock aspect ratio to maintain similarity while resizing. 6. Graphs (Word, Excel, PowerPoint). Graph is very important in mathematics. Microsoft Excel is capable of generating variety types of graphs including line graphs which can be used for graphing functions. 7. Patterns (Excel). We can use Microsoft Excel to generate patterns, or even random numbers. We can also use it to perform many mathematical computations. The example below finding the characteristics of the differences of cubic functions. 8. Proofs (Excel, PowerPoint). 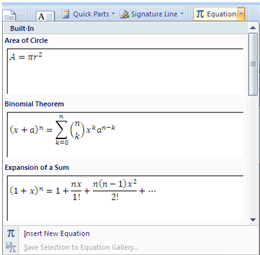 You can use the animation capability of MS PowerPoint to show some proofs. For example, it can be shown using the animation capability of PowerPoint to prove the Pythagorean Theorem (hmm… maybe I can make a tutorial about it later). We can also use MS Excel to exhaust solutions with numerous cases that is to cumbersome to be done manually. 9. Statistics. (Word, Excel). The Word Count of Microsoft Word can be used to count the number of characters, words, lines and paragraphs in a document. One possible activity is to let the students observe about the frequency of letters in a document. Using the Search feature (Ctrl + F) of MS Word, they would be able to tally that the letter e is the most common letter in English documents. On the other hand, MS Excel has many built in statistical commands. We will discuss many of them in the future. 10. Basic Computations (Excel). Aside from the many capabilities of MS Excel, it can be used to compute. It is particularly useful in computing large and small numbers which cannot be done using ordinary calculators. It is also capable of generating scientific notation in expressing small and large numbers.